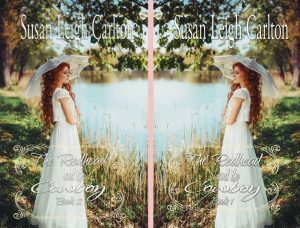 I released “The Redhead and the Cowboy” Books 1 and 2 Saturday, January 14, 2017. I am a genuine fan of western movies and one of my favorites is “Big Jake” starring John Wayne and Maureen O’Hara. The movie starts off with a raid on the McCandles Ranch to kidnap the grandson and hold him for ransom. Back in December, I was watching it for the umpteenth time and wondered about the back story. I wrote one about the lives of Jake and Martha before the range. Instead of the movie names, I used Will and Mattie Carrington. This became “The Redhead and the Cowboy: Book 1. My next idea was what happened after the movie ended. I wrote that too. It became “The Redhead and the Cowboy: Book 2. Will Carrington is a man of conviction. That conviction may lead to a battle he’s not prepared to win. Many in Texas believed he’d follow in his father’s footsteps by taking the helm of the Carrington Ranch, but wanderlust sent him far away from the life he knew and the life he’d someday wish he could get back. The Hansen girls built a reputation on being strong-willed and stubborn… none more so than eldest daughter Mattie, a fiery redhead with a temper to match. She spent her whole life making up for not being born a male. Now a lifetime of penance has led her to a laundry list of aggravation as her mother plays unsolicited matchmaker with her and the reluctant Carrington boy. Their futures on the line, will the stubborn heir apparent and the fiercely independent redhead give in to their mutual attraction or will their argumentative nature ruin any hopes of romance for them? Purchase “The Redhead and the Cowboy” here.